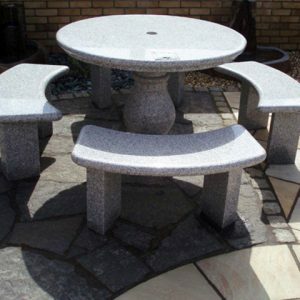 Our Oval Table & 2 Curved Benches is an all polished granite set and thus 100% maintenance free. The table is 1.7m in length and is drilled for an umbrella. Each bench is 1.65ml. This set weighs approx. 900kg. Photographed in oatmeal, this is also available in a light grey. Complete your outdoor living space in the most beautiful way with the Oval Table & 2 Benche set. This outdoor furnishing set has been used in a wide variety of settings. For homes, the set makes a lovely addition to the patio and can be placed in the garden to provide a place for dining al fresco. Commercial businesses may purchase one or more of these sets to create an outdoor seating area for clients, customers or employees to enjoy the fresh air, and the furniture sets are ideal for use in public gardens and parks to provide picnic areas. The Oval Table & 2 Benches is a complete set that provides everything needed to seat four to six adults comfortably. Measuring 1.7 meters long, the table has a striking oval top with a bevelled edge that is a stylish break from the usual round and square outdoor tables. Two elegant tapered column legs support the table, and the top is drilled for a sun umbrella for added convenience. Paired with the oval table is a pair of benches. Their crescent shapes not only allow them to fit the contours of the oval table, but they make it possible to seat more people in a minimal amount of space. 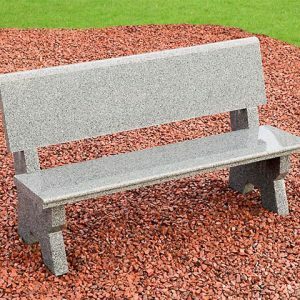 The benches are 1.65 metres long and feature block bases that contrast nicely with the rounded lines of the rest of the piece. 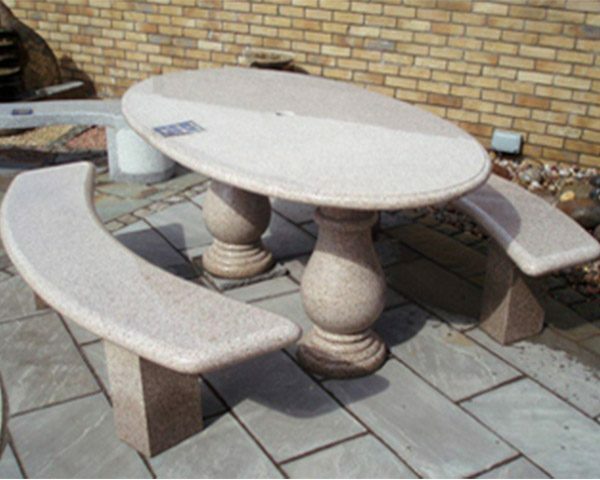 The stone garden table is the perfect alternative for those that expect to have more visitors. Crafted from granite, the set weighs 900 kilograms altogether. Because the stone furniture is fully polished, the Oval Table & 2 Benches will only require minimal maintenance in order to remain beautiful for years to come.